There are more than three dozen accredited criminal justice programs in Arizona, offering a range of educational paths, degree levels and specializations within the field. From a certificate in criminal justice to a PhD program, prospective students have many different locations and environments to choose from when it comes to higher education. 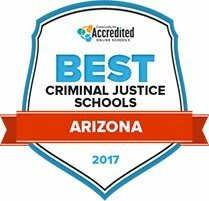 Those interested in criminal justice can explore their options here; with a school ranking list to help distinguish the best programs in Arizona, a search tool to help narrow down programs by criteria and a breakdown of where in-state criminal justice jobs are after graduation, finding the right criminal justice information is easier than ever for Arizona students. Making the decision to pursue criminal justice is a big commitment, and Arizona students should choose carefully among the many programs. The list below includes a compilation of the best criminal justice schools in Arizona, designed to help aspiring criminal justice students pinpoint the top programs in the state. Based on distinctions like program cost, class size and acceptance rate, students can check out the best Arizona criminal justice schools below. At Pima Community College, students may choose to pursue an associate of arts degree in administration of justice studies. Like many other degrees available at Pima, this program is comprised entirely of transferrable courses that will lead a student to further study at a four-year institution. While affording a college education is often difficult, Pima is happy to lighten any academic financial burdens through numerous forms of financial aid. Pima students will be able to stay on the right track to graduation by making appointments with a Pima academic advisor. Counseling and veteran's services are available to all students, as well. Arizona Western College offers several degrees in the criminal justice field, including an associate of arts and an associate of applied science in administration of justice, an associate of arts in cyber criminology, and a certificate in public safety. While many degrees offered at Arizona Western College afford student's with the opportunity to transfer to a four-year school after graduating with their associate's degree, many will also lead to job placement after just two years of study. Students can spend their extracurricular time on campus by participating in a student-run club or attending one of several campus events. Like many of the degrees offered at Yavapai College, the criminal justice and security certificate can be completed through web-based classes. These distance courses are especially beneficial to students who are living out-of-state or have other time constraints to take into consideration. Yavapai College offers a number of unique learning options in addition to their traditional programs, as well, including non-credit courses for personal interest and courses geared towards kids ages five to seventeen. Yavapai students may also spend their free time by attending the YC art gallery and sculpture garden or attending a production at the Yavapai College Performing Arts Center. Eastern Arizona College offers several programs in the field of administration of justice, including an associate of arts degree, an associate of applied science degree, and an associate of applied science degree that leads into a bachelor's program. East Arizona College puts the education of its students in the hands of experienced faculty members who are highly trained in their respective fields. Students who wish to live on the EAC campus will be housed in modern, comfortable facilities, and will have the added benefit of close proximity to their classrooms. Writing and math skills centers are available for struggling students, as well as one-on-one tutoring is available for several other subjects. Conchise College offers an Administration of Justice degree program that follows a comprehensive curriculum that prepares students to thrive in criminal justice occupations or to transfer to a four-year academic program after graduation. The program consists of 64 credit hours that are typically completed in four semesters. Students are also required to attend academic advising to help them determine the best learning path for their desired profession in the field. With department permission, students can also receive credit for completion of certified law enforcement training with eligible agencies. The University of Arizona (UA) offers a variety of criminal justice, legal and government related degree programs through its College of Government and Public Policy. Examples of programs include a BS degree in criminal justice, a BA degree in law studies, an accelerated master's degree in legal studies and a master's degree in international security studies. Students interested in pursuing a BS in criminal justice can complete the program in four years, which includes general education courses, justice related electives, core requirements and an internship. The UA campus houses the Rombach Institute of Crime, Delinquency and Corrections, providing students opportunities for internships and extracurricular learning. Students interested in a career in law enforcement management can earn a Bachelor of Arts in Law Enforcement through Ottawa University's Arts and Sciences Department. Courses are offered online, providing flexibility for students currently working full-time, military students and those with family obligations. Ottawa has a generous credit transfer policy, and students may also be able to earn credits for coursework completed at a police academy. The curriculum was designed in part by police professionals, and places emphasis on policing and court procedures, criminal and human behavior and developing leadership skills. Ottawa also offers a liberal arts degree for pre-law students. Whether searching for a certificate program or applying for grad school, Arizona's academies, colleges and universities offer many different pathways to a criminal justice degree. For a more complete look at the options, use the search tool below. Aspiring criminal justice students can sort based on the criteria most important to them. Students can find out which Arizona schools offer their desired degree and specialization or major, along with school population size, acceptance rates and more. As students start looking for criminal justice schools in Arizona, they should also determine what area or specialization they'd like to focus their studies on. Because criminal justice covers many legal and protective service fields, it's good to know if there are going to be job opportunities in those fields after graduation. The list below gives some insight into the most popular criminal justice fields in Arizona, so students can see lists the number of people with those jobs, their median salary and the degree level that they need to complete to work in-state. As students explore Arizona's criminal justice schools and the specializations they offer within the field, it's also helpful to look at how their state compares with the rest of the nation. Is it smart to pursue criminal justice in Arizona? Whether students are interested in working in a courthouse on the judge's bench or want to get involved in public or environmental law enforcement, it's helpful to see how these jobs stack up in-state compared to national averages. The specializations below are compared with national numbers in terms of salary and potential for growth. Students at criminal justice schools in Arizona will likely want to know where they can potentially work after earning their degree or certification, and in which areas of the state they can expect to make the best salary. The map below includes stats for protective and legal occupations across the state, so students can explore the total number of people who hold careers in the field in which cities or regions. Scroll over the markers on the map to compare this and salary details specific to each area. The Business Engagement and Compliance Office ensures that all subcontractors and consultants are in compliance with federal regulations. Business compliance professionals can may attend events put on by the BECO for job opportunities and networking. A voluntary professional organization, the AECC is dedicated to promoting ethical practices across industry and serving as a forum for professionals who meet to exchange information, share best practices and build networks. This free online source helps small businesses get off the ground in good standing with compliance standards. It has information for all licensing, and has contact information for additional state resources to aid in business growth. A member-based organization, the ACA has annual conferences, continuing education opportunities and professional development resources. Members receive discounts on AVIS, Budget rental cars and the Justice Federal Credit Union. Corrections Officers can look here for job opportunities throughout the state, as well as find numerous other resources. The department's policies and mission statement are here as well, which would be handy for professionals in the field to know. The COTA provides pre-service training for Arizona Department of Corrections Officers, as well as for officers from county, tribal and city correctional facilities. It is a vital resource at the local, state and national level. CPO is a national non-profit that works as a charitable organization to support families of officers who have died while protecting the public. The organization also offers a scholarship opportunity for students entering into the field of corrections. The AJC is a policy-making body that oversees the judicial system in Arizona. It has numerous committees, the members of which make recommendations on policies and issues that affect the court system statewide. A member-based organization, AMCA was founded in 1961 with the mission to promote excellence and professionalism. It also holds the goal of supporting its members through communication and educational opportunities, and it has a multitude of programs and institutes for the latter. The site is a resource hub for judges in the state of Arizona. It has contact information, mailing addresses, forms and information on judicial misconduct and disability. The ALCU of Arizona is a local branch of the national organization. The group has information for professionals to stay up-to-date on the latest issues that affect professionals and people in Arizona. It also offers resources for how working professionals can get involved in local cases. AzELA is a group of lawyers who jointly represent employees in legal matters. It has more than 60 lawyer-members who make up a specialty bar association. AzELA is an affiliate of the National Employment Lawyers Association, and provides its members with opportunities to fulfill continuing legal education. With locations all around the state, CLS is a non-profit organization that strives to assure fairness in the justice system regardless of a client's income. They pay specific attention to clients who fall below the poverty line, and have employment opportunities as well as the Volunteer Lawyers Program (VLP) which professionals can sign up with to provide legal advocacy and pro bono representation. A hub of information for both lawyers and members of the public, the state bar website has a wealth of resources. Lawyers can join as members and get the latest information on professional development and volunteer opportunities. Members receive discounts and services, like email, the newsletter and the attorney career center. At its core, DPS is a state-level law enforcement agency that works in close contact with other agencies to protect the public. In addition, it is a service organization that provides a broad range of opportunities and information to the criminal justice community and to Arizona's inhabitants. A membership organization, APA is unlike many others in that it is an association of groups rather than individuals. These members must have individuals within that are sworn Arizona law enforcement or correctional officers. The APA lobbies on behalf of its members to the state legislature, endorses political candidates and represents its members to the press. It also offers training sessions to local professionals regarding current issues facing the law enforcement community. AZ PLEA holds as its mission the promotion of the positive role of the police profession. It is a member-based organization that swears to protect its members' rights through representation and professional relationships with the community. It offers training and classes, discounts and forums to members. Fish and game wardens can find a community network here at Arizona Game and Fish. The website has information on hunting, fishing, outdoor recreation and boating and provides ways to connect with organizations for hunters, fishers, shooters and off-roaders. AWF is a non-profit organization that is dedicated to educating individuals and organization on the value of conserving, managing and protecting wildlife and its habitat. It offers scholarships to students that may go into the conservation or protection fields, and awards to businesses and individuals who do conservation work. It is also a membership organization that can serve as a networking system for people under the protection services of wildlife umbrella. Park rangers or game wardens can find specific information on Arizona's forests and grasslands here. There are many opportunities for volunteering, partnering or joining a committee.